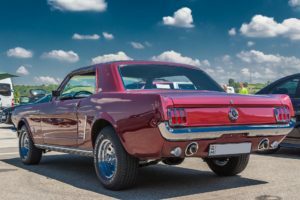 The 1965 Ford Mustang is a pony car that’s been making history since it first hit the market, and it’s easy to see why. Its sleek lines and the throaty growl of its powerful V8 engine make this a ride that’s a thrill to drive and a pleasure to look at whether it’s parked or cruising down the street. Whirling in the mind of a young Lee Iacocca, was the concept of introducing a reasonably priced sports car to a youth flooded car market. So, in April 1964 at the Worlds Fair, the first Ford Mustang was introduced. The response was tremendous. Nearly 700,000 buyers weighed in and the popularity of this car was established. The Mustang was Ford’s response to the popular Chevrolet Corvair. But, much more than that, it set the stage for the muscle car era. The 65 “‘tang” made the cover of Time and Newsweek before it hit the market to entice an awaiting buyer. The first release of this car made a sales record for the car industry. The basic car had a 101-horsepower six-cylinder engine with a three-speed manual transmission floor shift, but quickly, a 260-cubic-inch V-8 with 164 horsepower was offered. The 289-cubic-inch version of that V-8 with 200, 225 and 271 horsepower were the next available options. The 260 and the 289 caught the attention of Carroll Shelby and were placed in his Cobra cars. The V8 engines sold 3-to-1 over the 6-cylinder motors. The fastback design evolved as a collaboration between Ford and Carroll Shelby. Two engine versions were introduced. One with a 306hp as a street version and the other 360hp (GT-350R) that was ready to race. Thus the highly collectible Shelby Mustang fastback made its appearance. The hardtop (the model shown in the image above) was the most popular of the Mustang designs in 1965. Ford sold over 500,000 hardtop models. That was heads over the convertible and fastback models. The first run of the Mustang was 1964 & 1/2 that included the coupe and the convertible. The Convertible sold to over 100,000 buyers. The 1965 Ford Mustang is still as popular among automotive enthusiasts today as when it was first introduced. To browse through the selection of 1965 Ford Mustangs currently for sale on eBay, click here. Part of the reason Classic Cars Online US exists is to help connect classic car buyers and sellers, and we’ve added several ways for you to connect – pick your favorite, or join us in all four places: (1) sign up for the newsletter on the upper right side of this page, or 2) visit the Classifieds page here on the site, (3) visit and like this site’s Facebook page, (4) the Best Classic Cars for Sale Online page or (5) join the Classic Cars Online: Classic Cars for Sale group if you are looking to buy or sell classic cars such as the classic 1965 Ford Mustang.